The appearance of a pair of cockatrices right at the end of last week’s game meant that we got straight into the action this week. 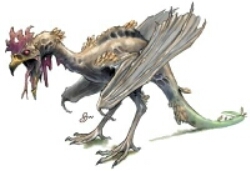 Cockatrices are a peculiar breed of monster, both in terms of their legend (snake eggs hatched by cockerels) and in the fear they inspire among players. From a design point of view, aside from looking repulsive, they’re best described as a glass cannon. They are physically weak, but punch above their weight due to their ability to turn their opponents to stone. Unfortunately for my exposition plans, I’d left the cleric Muroni nearest the entrance so the cockatrices had to go through her to get to the party. On the positive side of things, when this mysterious NPC succumbed to the calcifying venom of their bite, it focused people’s attention very quickly. The cockatrices were quickly defeated, despite the wearied state of the adventurers after last week’s epic struggles. With no means available to restore her to life, they were forced leave her in the darkness of the scorpion’s chamber, shrouded in blankets to protect the statue she’d become in case they found a cure. This then triggered a debate about whether they should again retreat to the camp, but they decided to press on. This was partly from realising that they had only been at the temple for about twenty minutes, and that they still didn’t really know what progress the Emerald Claw had made. The older hands in my group are used to my employing a timeline within dungeons. The thought of their enemies possibly returning to the camp in triumph with some earth shattering artifact gave them pause, even though it was tempting to try and set up an ambush in reflection of how their enemies had waited for them at Whitehearth. They decided instead to try the stairs that the skeletons had approached from, and began their ascent into the darkness of the windowless second level. They quickly overcame a contingent of troops who had been putting finishing touches to a mechanism and worked out that it was designed to breach an enormous set of sealed doors. 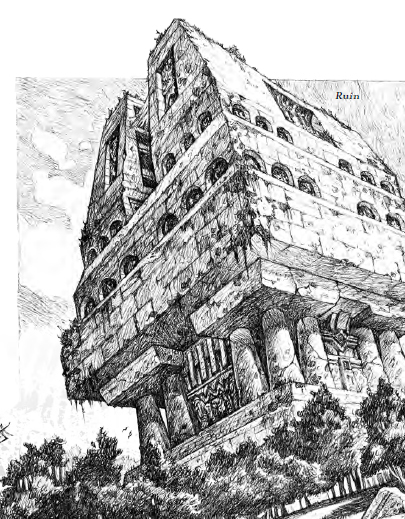 Beyond the doors was a dark room still a couple of foot deep in water, lit by two faintly glowing portals and dominated by a glyph-covered ziggurat. Water was luring out of one portal, while the other was now several foot above the water level. Examination of the runes suggested that this second portal was a one-way exit through which water had recently been flowing. Unfortunately, they were not alone in this chamber. Even as they began exploring and trying to work out what was going on, an undead elf, warped into a horrible creature called a Drowned, was moving in for the kill. The adventurers didn’t even realise they were under attack, even when Bumperklart collapsed. Drowned emanate a continuous field in a thirty foot radius that drowns air breathers, requiring successively harder saves to hold your breath and resist the effect. The people who went to help Bumperklart began to succumb to its effects themselves, and were barely able to get out of the area alive. Kurtis’ sharp eyes spotted the creature lying in the water next to the door, and Ruin waded in to try and kill it. This proved harder than expected. Ruin, as a warforged, did not need to breath, but his opponent was tough and strong, rapidly healing most of its wounds as fast as Ruin could inflict them. Kurtis provided covering fire, while Carbon waded in to try and help, narrowly resisting the effects of the drowning field each round. Keil was able to revive Quilynn and between them they got Bumperklart back on his feet. Still badly hurt, he rejoined the fight, and between them they were able to narrowly defeat the chamber’s guardian. We ended the session there, ready to pick up with a more uninterrupted exploration of the dark chamber before them.